A longtime resident of Canton, Osama grew up in an Arab Ameri-can family with Palestinian roots. Seeking higher education, his father and mother, Hassan Odeh and Yamamah Sawalha moved to the United States where they established themselves in 1990. In 2001 they settled in Plymouth, Michigan where they have remained since. Osama began attending Islamic Schools from a very young age. He was a student at Huda School, Crescent Academy, and later graduated from Canton High School in 2009. In 2013 Osama graduated from Wayne State University with a degree in Biological Sciences. As a child, Osama’s mother would emphasize a powerful religious foundation. Anse Yamamah is a known teacher of the religion in Palestine. Throughout his youth, she would spend extra hours daily after school tutoring him in formal Arabic, Quran memorization, and in studies of Islamic History. 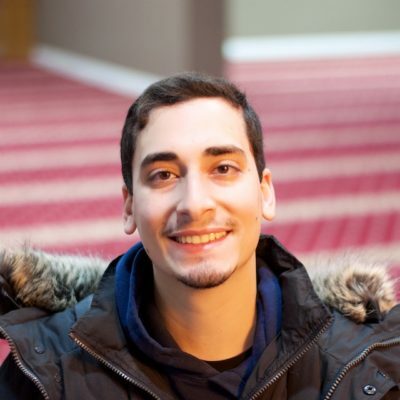 In his college years, Osama found a passion for religious education and community development. He became the president of the Muslim Community at Wayne State and a mentor for youth in the Canton Community. Focused on building a vibrant Muslim community with pure ideals, he would work at teaching youth and guiding them, through being a teacher at the Sunnah Saturday program, as well as weekly halaqas for high school boys. Osama is currently enrolled in an MPH program at Wayne State University. Apart from classes at Wayne State, Osama studies at the hands of Muslim scholars privately in multiple sciences including Quran and Law. He hopes to continue his education while serving as a Youth Director, in hopes of fostering healthy and vibrant families and communities.